Started Friday morning in Council Bluffs, Iowa. "Field of Dreams" cliches aside ("Is this heaven?" "No, it's Iowa"), the Iowa countryside is actually quite attractive. It's not, however, made for speed. The Lincoln Highway -- usually the first improved road in the areas it traverses -- was often bypassed decades ago, forcing the traveler to follow a confusing network of county roads with names like E53. Locals in a number of towns have painted the Lincoln Highway logo on utility poles as a guide, but those poles are much more readable at a Model T's speed than at the pace of modern traffic. 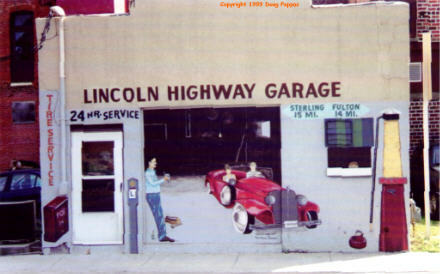 With a dinner date in Arlington Heights, Illinois, I couldn't afford to dawdle, so by late morning I was sticking closely to US 30, detouring only where I knew there were Lincoln Highway sights. Foremost of these is the bridge in Tama, Iowa, which has "Lincoln Highway" carved into its support pillars, with the late George Preston's gas station in Belle Plaine a close second. Every inch of Preston's station is covered with old oil company signs, and until his death Preston was an inexhaustible source of stories about the old road. (An Iowa newspaper led his obituary with the line, "Fewer words will be spoken in Iowa today.") For baseball fans, the LH runs along Anson Street in Marshalltown, Iowa -- a street named for the family of Hall of Famer Adrian "Cap" Anson. After crossing the Mississippi and seeing a new LH-themed mural in Morrison, Illinois, I opted for the Interstate. This cost me a chance to visit Ronald Reagan's Boyhood Home in Dixon, Illinois, but by the next exit, that disappointment had passed. Had planned to drive back Saturday morning to finish the route, but when Friday night's socializing ended well after midnight, I wasn't about to get up early enough to finish the trip before the trip's final social event, a 1 PM lunch in Chicago. Then, with a couple of hours to kill, I drove down to Hyde Park to walk the streets near My Dear Old Alma Mater for the first time in a decade. The old dorm looks much as ever, except that the old windows have been replaced with modern, insulated models. If those had been in place in our day, we could never have frozen Wendell out of his room the way we did during his first northern winter... The path across the Midway was as muddy as ever in the spring. Alas, no historic marker yet notes the spot where Dan dislocated Steve's kneecap, and no directional signs have been posted which would've helped Bill find his way home after class. The main Quad looks EXACTLY the same, and will probably look the same 20 years from now, too. So in the end, I covered all of Route 66, but only about 90% of the Lincoln Highway west of Plainfield. Shoot me. Final totals: 6,240.7 miles driven, 13 rolls of film shot (nine of Route 66, three from the Lincoln Highway and one of friends/miscellaneous shots), eight of a hoped-for nine friends visited en route (sorry about that flu, Steven), and 15 enjoyable days on the road. Glad to see those of you I met en route; looking forward to seeing the rest of you soon. Watch for another weeklong travelogue in late August or September -- until then, hope to hear from you soon!